Delhi's Paharganj tourist district is located right opposite New Delhi Railway Station. Step out of the railway station and cross the road and you'll be at the entrance to Paharganj's main thoroughfare, called the Main Bazaar. It stretches for roughly one kilometer (0.6 miles) and teems with an endless procession of people, animals, and vehicles. Paharganj is definitely not for the faint of heart. It's chaotic, noisy, dirty, and full of crumbling buildings. The area is favored by backpackers and budget travelers for its multitude of cheap accommodations. However, some of the best bargain shopping in Delhi can also be found in Paharganj. The whole Main Bazaar is lined with shops full to the brim with books, music, jewelry, bags, clothes, shoes, incense, textiles, wooden statues, and handicrafts. 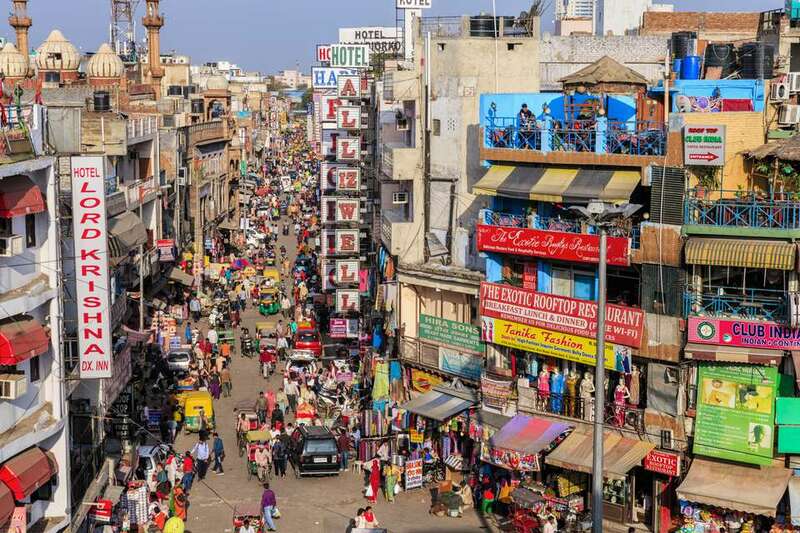 Many of the shops in Paharganj deal in wholesale and export to foreign countries, making the Main Bazaar a good place to come and hunt out unique and inexpensive goods to import back home. Head down the Main Bazaar from New Delhi Railway Station and you'll come across a number of shops selling colorful embroidered textiles. The first shop, Shanti Handloom, is located on the right-hand side of the road at 45 Main Bazaar. There are others further along on both sides of the road. These shops are overflowing with eye-catching bags, bedspreads, cushion covers, wall hangings, and other textiles in endless colors and designs. A lot of the stock, especially that with mirror work on it, is typical of the kind of goods produced in India's desert state of Rajasthan. Continue along the Main Bazaar and you'll see quite a few handicraft and jewelry shops, particularly on the left-hand side of the road. These shops stock a seriously bewildering variety of handmade beaded necklaces and bangles in every shape, size, and color that you could possibly want. They also have a range of other handicrafts including carved wooden statues of gods and goddesses, brass wares, decorations, and even phonographs. Shoe shops often dominate the Main Bazaar in Paharganj, and you'll encounter them at various locations all along the stretch of road. Some of the shoe shops are almost drowning in shoes, without an inch of spare space to be seen. They stock every type of shoe imaginable, from colored leather sandals to more traditional style Indian footwear. A short distance before the police post and intersection in front of the Shelton Hotel at 5043 Main Bazaar, there's a smallish shop on the left-hand side of the road that specializes in incense and devotional needs. This shop is the place to come if you want to buy incense sticks, incense cones, or Indian tea. Whatever type of incense you're after, they're sure to have it. The shopkeepers will eagerly take the items out of their boxes so you can smell them too! The area around the Shelton Hotel, at 5043 Main Bazaar, is home to a number of mehendiwalas (artists that apply henna to women's hands and feet). The mehendiwala in the picture above is a softly spoken and polite gentleman, who has a small shop just opposite the Shelton Hotel. He'll apply mehendi (henna) to your hands and arms, or feet, in an intricate design of your choosing from one of his books. In India, women traditionally apply mehendi to their hands before weddings and other festivals. Most of the time they get it done by a professional mehendiwala, or if time is short, they'll do it themselves. Walk a short distance past the Shelton Hotel at 5043 Main Bazaar, and you'll come across shops selling books and music. There's also another great bookstore called Pilgrims Book House at 1625 Raj Guru Road (the road that leads right off the Main Bazaar to the Imperial Cinema). These shops are stacked with a huge variety of books, including travel books such as those by Lonely Planet, Indian fiction and non-fiction, cultural books, and contemporary novels. Quite a few books are in languages other than English. You'll also find lots of traditional and classical Indian music CDs, and relaxation and meditation CDs. There are some attractive postcards too. Towards the end of the Paharganj Main Bazaar, near the Anoop Hotel and Khanna Cinema, there are a couple of narrow but deep shops displaying hookah pipes in their front windows. These shops stock a wide range of hookah pipes in assorted sizes, along with other smoking paraphernalia. Hookah pipes, which originated from the Middle East, have become extremely popular in India in recent years. Fruit flavored tobacco is heated by coals, and the smoke is passed through tubes and water to cool it down before it's inhaled. A short distance further along the Main Bazaar, past the Anoop Hotel and next to Medikos Opticals on the right at 1588 Main Bazaar, is a shop set a little back from the road selling all sorts of colorful women's clothing. This store is a personal favorite! It has two levels of gorgeous brightly colored and patterned women's clothes in assorted designs that include dresses, skirts, and short and long sleeve tops. If you're a hippy at heart then you'll love this shop. Towards the end of the Paharganj Main Bazaar, on the left side of the road before the intersection of Raj Guru road (that road that leads right to the Imperial Cinema), is a group of small shops selling motif t-shirts. The t-shirts in these shops are really popular with travelers to India from all around the world. Up for grabs are t-shirts with the popular "Sab Kuch Milega" slogan (meaning "You'll Get Everything"/ "Everything is Possible" in Hindi), as well t-shirts featuring the sacred Hindu "Om" symbol, Ganesh (the Hindu elephant-headed god of good fortune), Buddha, Tibetan, and other designs.